This book accompanies an exhibition Bal curated for the Munch Museum, Oslo, in Spring 2017. But it is not a catalogue. The exhibition, and the book, integrate Munch’s brilliant modernist paintings with a reflection on modern sensibilities as it also appears in the writings of Gustave Flaubert, especially his groundbreaking modernist, perhaps even postmodernist novel Madame Bovary, from 1856. In a series of video installations and a feature film, Bal & Michelle Williams Gamaker updated this novel for today’s societies. These video installations are put in dialogue with Munch’s images. Bal radically reinterprets Munch’s work. She approaches it not through the lens of biography, nor by denying any personification in the work. Munch made a point about being personally involved in his work, and Flaubert famously declared “Madame Bovary, c’est moi”. 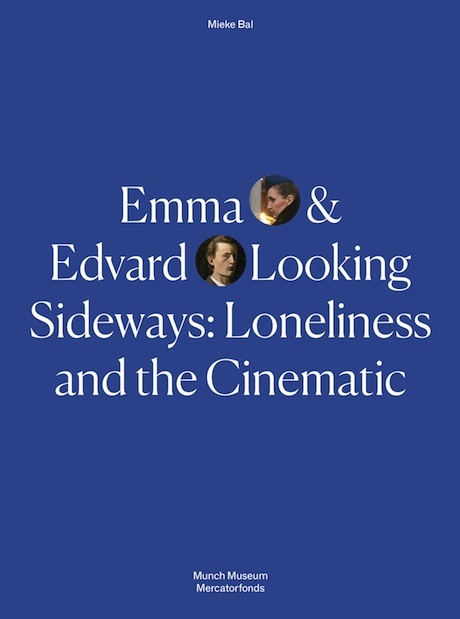 Instead, she stages a fictional figure, Edvard, who, along with the equally fictional Emma, guides viewers to adopt an empathic view of what is put before them. From colour to brushstroke, composition and the tiniest detail, the analyses in this book present a hitherto unknown Munch. Bal’s key term is “the cinematic”, which provides a key to such features as the illusion of movement, pentimenti, cropping as if to stay within a frame, but also to the effect of being alone in the dark, watching without being seen. The sideways look that the self-portrait on the book’s cover shows suggests a way of avoiding visual engagement. The result: loneliness. The book traverses a number of stages in the fictional development of the characters, from their youthful shyness to their deaths, always with close attention to the visual features of the works.